We’re through five games in both the NBA’s Eastern and Western Conference Finals and there have been some surprising results so far. The Oklahoma City Thunder and the Boston Celtics both lead three games to two in their best of seven series against the San Antonio Spurs and the Miami Heat, respectively, which makes game six of both series compelling drama. If you haven’t been watching, I highly suggest you tune in to TNT at 9 PM tonight to catch the Thunder try to close out the Western Conference in Oklahoma City, and then to ESPN tomorrow night at 8:30 PM to see if the Celtics can do the same in the East at the Boston Garden. 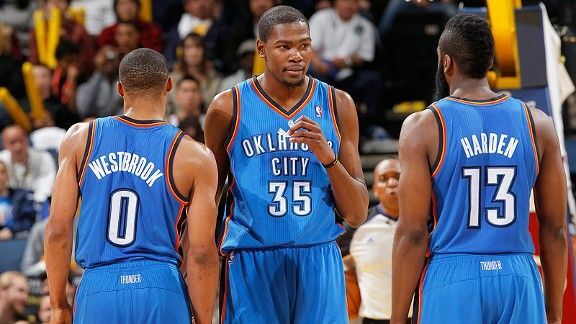 Westbrook, Durant, and Harden seem to have found the Spurs weaknesses. After a 20 game win streak by the Spurs, the Thunder have now won three straight to grab ahold of the upper-hand in the Western Conference. I’ll admit I got caught up in the hype of the Spurs when they were looking like they were unstoppable, but right now it appears the Thunder have their number and their young legs might be too much for the Spurs to overcome. From my perspective, the biggest reason for the Spurs recent struggles have been the play of Tony Parker, who the Thunder have made look downright pedestrian over the past 3 games. Parker has scored only 16 points (6-12 shooting), 12 points (5-15 shooting), and 20 points (5-14 shooting) in the three most recent losses and adding just four assists in each game. The Spurs need more production from their point guard and Coach Gregg Popovich tried to account for that by starting Manu Ginobli (who scored 34 points and had 7 assists to lead the Spurs in Game Five) and essentially benching Danny Green who has not had a good series thus far. To give credit to the Thunder, Kevin Durant is playing like the best player remaining in the playoffs right now. He’s scored 143 points in this series with 27 assists to just 13 turnovers, and the way that he took over in game four (scoring 18 of his 36 points in the final seven minutes) has shown that the 3-time NBA Scoring Champion can produce in the postseason as well as the regular season. As I mentioned in my preview for this series, the Spurs don’t really have anyone who can match Durant and he is a tough player to guard at 6’9” with a 7’5” wingspan. Russell Westbrook has also done a better job protecting the ball than I would have expected in this series as he only has 15 turnovers through the five games and has scored 84 points to go along with 39 assists. Game six being played in Oklahoma City has to give the Thunder the advantage in this series, as that arena and those fans are a raucous bunch. They don’t have too much else going on out there in OKC so the fans at the Chesapeake Energy Arena are more rowdy like a college basketball crowd than the typical corporate professional crowds at most arenas (or the silent library crowd in Miami). Just like the Thunder, the Celtics have come back from their 2-0 hole in this series to take a 3-2 lead with the series shifting back to Boston tomorrow night. It hasn’t always been pretty, but the Celtics are playing their typical “bar fight” style and out-working and out-hustling the Heat. The Celtics also are doing less complaining to the officials during the plays and in transition, but instead complaining about calls during dead-ball situations and have been called for eight technical fouls so far this series to the Heat’s one. I’ve said it before and I’ll say it again, the Boston Celtics will go as far as Rajon Rondo takes them. Even last night as Rondo seemingly slept-walk through the first three quarters, shooting an ugly 1-9 with just three points through three quarters in the first game back to the American Airlines Arena since dropping 44 points, 10 assists and 8 rebounds in an all-time great individual performance in game two, the Celtics knew they could count on him when they needed him. And with just under 5 minutes remaining in the game Rondo hit two tear-drop layups to keep the Heat lead at just one point and the Celtics in the game. He finished the game with 7 points, 13 assists and 6 rebounds, but the key thing that he added to this game was his leadership and poise. After the game Rondo said to the media “my teammates told me to keep attacking. I made some mistakes I usually don’t make. I missed a lot of shots I usually make. But that’s irrelevant. We stuck with it and my teammates believed in me.” That quote right there really sums up the 2012 Boston Celtics perfectly. Paul Pierce will be a key for the Celtics in game six. He hit one of the biggest clutch shots of his career last night, a 3 pointer to push the C’s lead to 4 in the final minute, and the Celtics will need him to play well again at the Garden to make sure that this series doesn’t go back to Miami for a game seven. Pierce finished with 19 points on 19 shots last night, but he will be most remembered for hitting that dagger 3 and putting the Celtics up in this series. Kevin Garnett put in another classic KG performance scoring 26 points and adding 11 rebounds yesterday, and reserve guard Mickael Pietrus had a huge game coming off the bench scoring 13 points on just 4 shots and picking up some of the slack for Ray Allen who shot 2-9, good for 13 points himself. Game six tomorrow night will be a show and you know that the Celtics almost need this win so they can have a couple extra days rest before playing in the NBA Finals. They don’t want this series going back to Miami for a winner-take-all game, so expect the Green to up the intensity just one more time and take care of business at home Thursday. Will the Heat respond, especially Dwyane Wade, who despite scoring 27 points had another slow first half last night (something that the Heat can’t afford in Boston), we will find out in about 30 hours. In the immortal words of Bart Scott: “can’t wait”. This entry was posted in NBA and tagged Basketball, Celtics, Heat, NBA, NBA Playoffs, Sports, Spurs, Thunder. Bookmark the permalink. That 3 pointer was play of the game in my opinion! It certainly was! It was one of those shots that the Celtics needed at that point and one that Pierce has provided throughout his career. He misses that shot the team is probably looking at a different scenario this morning, but thankfully he knocked it down! By the way, thanks for checking out my blog. Yours is very interesting too!